ALL FORMS MUST BE EMAILED TO: rrinaggio@paterson.k12.nj.us. 1. All items will be received in the dock area of 200 Sheridan Ave.
2. Check the delivery to make sure the consignee is for central stores food service or facilities. 3. All shipments received will be taken into the boom room and checked to make sure it is complete before shipper is made. exception will be the copy paper which will be put away on the dock in the racks. (no other items will be left on the dock. be in the receiving register immediately. the delivery ticket will be attached to the purchase order. 5. United Parcel Service (UPS) Roadway Parcel Service (RPS) and air shipments: count the number of packages and sign the drivers pad for the quantity received. if there is damage to one or more of the packages, record it on the signed pad. all packages will be logged in the receiving register immediately. 6. Checking in the items received. on the packing slip . do not write on the golden rod copy of the purchase order. please use the white copy provided for you by the secretary. if the quantity on the packing slip matches the the quantity on the purchase order circle the quantity on the p. o. if not put quantity received and date received in the description area of the p.o. if there is a mistake or wrong item has been sent please notify secretary immediately. 7. Incomplete purchase orders; the secretary will contact the vendor on the balance of the shipment. fill out a call sheet indicating vendor, telephone number, spoke to, results. follow up until p.o. is complete. keep supervisor informed of each open p.o. and what has transpired. 8. completed purchase orders: the secretary will check to make sure all items have been checked off and received. the completed p.o. will be given to the person that is doing the transmittal that will be sent down to the accounts payable department. To request the Transfer or Disposal of an item(s) the forms below must be completed and faxed to Central Stores for pick up. Absolutely, no request(s) will be processed without the proper forms completed and faxed to Central Stores. The items picked up will be shared among other locations in the District. If an item or a group of items are no longer needed or need to be disposed, the Department of Purchasing will process the disposal pursuant to title 18A. All requests shall be faxed to Central Stores Office at 973-321-0941. Fixed Assets stored in the warehouse. 1. Fixed asset are received in the warehouse if it a valued at 2000 or greater. 2. Following the Purchase Order generation and approval process (Refer to the Purchasing Memo) the PO is distributed by the Purchasing Department to the affected parties. 3. The “Receiving Copy “Goldenrod of the PO is sent from the Purchasing Department to the warehouse. 4. When fixed assets arrive at the warehouse two Central Stores staff member are responsible the shipments. They ensure that the correct item and number of items have been delivered by comparing the delivered goods to the goldenrod copy of the PO. The Central Store staff members circle the received item on the PO and initial and date it. The packing list which accompanies all deliveries is also attached to the PO. 5. The two Central Stores staff member record the received fixed asset into a receiving log sheet by hand writing the fixed asset into the log sheet. Every log sheet included the PO number, date department or school the item will be delivered to item description, quantity received, serial number. 6. Later that day the Central Stores secretary enters data provided on the receiving log sheet into the Edu-Met. Edu-Met does not receive data electronically from other system. 7. The Fixed assets are than tagged by the Central Store Secretary. Tagging a fixed asset means labeling it with its identifying barcode (the number on the tag) and “Paterson Public School.” The Central Store secretary maintains a spool of number tags in the office upstairs. 8. The Central Store Supervisor or Central Store secretary calls the requester of the fixed asset, as stated on the goldenrod copy of the PO to validate the order and inform the requestor of its delivery. 9. A shipper form is completed by the Central Store staff to accompany all fixed asset every time any item is distributed. It identifies the nature /description of the item including its quantity, requestor, PO number date and a li ne for the receiver to sign and the location where the goods will be delivered. 10. Fixed assets may be picked up at the warehouse by an employee from the requesting school/department or they can be delivered by a Central Store Driver. Fixed assets are distributed based on the first in first out method. Fixed assets are assigned to whoever the requestor is a described in the PO. 11. If a fixed assets are picked up, the employee picking them up signs and receives a copy of the shipper. The original shipper is stored in a file cabinet at the warehouse indefinitely. The original shipper with the recipient signature on it, is stored along with its respective white and blue copy of the PO at the warehouse in a cabinet located in a office that is locked every night. 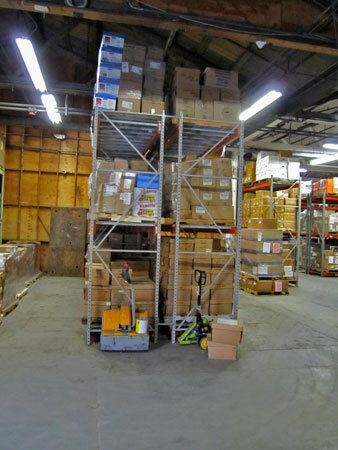 12 If the fixed assets are delivered, the Central Store driver checks the shipper and the item prior to leaving the warehouse, to ensure that the correct items are being delivered. When the Central Store driver arrives at the receiving location he will check the assets against the shipper with the receiving party. 13. When the delivery is made, the recipient signs the shipper, a copy is given to receiving school. Original shipper is sent back to Central Store by our drivers and stored in a file cabinet. To store records in the Central Stores Office, department records must appear on an approved Records Retention Schedule, be scheduled for a minimum of one year storage, be properly packed in Storage Retention Boxes, be properly identified and documented for transfer and reference, have a specific month and year date when the disposition will occur. Questions concerning transfer, criteria, or storage should be directed to the Supervisor of the Central Stores Office at 973-321-0941. Item 1 - Department Information - Enter department name. found on the records retention schedule. Use a separate form for each box. Item 4 - Date Completed - The date the form is being completed for submission. Item 6 - Title - The person who did the packing and paperwork Supervisor, Secretary etc. Item 7 - Telephone # - Phone number of the person to contact if there are any questions. Item 8 - Location of Records - Building name, street address, etc. Item 9 - Department Box # - The number assigned to each box being transferred. and file range. This description must be detailed to facilitate referencing. Item 11 - Access Restriction - Indicate if records are deemed to be confidential. Item 12 - Disposition Codes - Indicates how we store the items according to regulations. If a school has a surplus of textbooks they should go to the Central Stores Website for instructions and to download the "Textbook Sharing Form". The "Textbook Sharing Form" is the only form utilized to transfer textbooks to the Central Stores locations. Once all the textbooks are inventoried and the form completed, the school shall contact Central Stores for pick-up. Central Stores then verifies the "Textbook Sharing Form" and delivers the textbooks to the warehouse. All the textbooks picked up from all locations are compiled and posted online for redistribution within the District. After two weeks, the list is entered in the State’s Textbook Sharing database for 120 days. After this period the textbooks can be sold via public sale pursuant to 18A. Before requesting any transfer, schools must document all the items being transfer using the "Textbook Sharing Form". This form can be downloaded below. The "Textbook Sharing Form" must be filled out completely and signed by the Principal. No boxes will be picked up without this form properly filled. All boxes should be packed so one person can lift the box. No oversize boxes will be accepted. Once all the items are properly packed and documented, Central Stores will verify and pick up the items for proper disposal. When a department no longer needs a usable asset, that asset is stored for redistribution to other interested departments in the District. Assets are stored at the Central Stores, which is managed by the Business Office. Items available for redistribution will be posted on our Web Site. When the District no longer needs an asset, the Purchasing Department will dispose of the asset in compliance with 18A regulations, via resolution. Specifications are developed and the asset sold at a public sale to the highest acceptable bidder, pursuant to title 18A. Revenues generated by the sale of the surplus assets are deposited to a general fund and is not reallocated to individual departments. The trade in value is deducted from the purchase price charged to a department's account. Surplus furniture in storage is immediately available for redistribution within the District. You can visit the Central Stores to inspect this furniture, to schedule a visit please contact Rocco Rinaggio, Central Stores Supervisor. In some cases the surplus equipment will be transferred directly from location to location, therefore saving transportation and space resources. The only method of moving equipment from place to place is by contacting Central Stores. Central Stores will keep track of all transferred surplus equipment.